Western Addition Maps created for Japantown Task Force cover the 16 to 20 blocks of today's Japantown at 5 dates from 1940 to 2004. The linked page includes a little more history and 5 thumbnail maps that link to full-detail (11x17) PDFs. 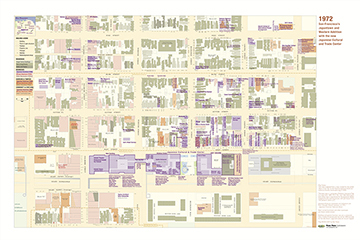 A simple map of 4 blocks, Post and Buchanan, at 5 dates)1910, 1940, 1950, 1972, 2000 (on this page are reasonably readable JPEGs, and a link to the 6-page PDF). San Francisco has been one of the main ports of entry from Japan, and a gateway for much of California and the western United States. It was a local hub for the Bay Area, with close links to Oakland, Berkeley, the East Bay and Peninsula flower industries, plus San Mateo, and San Jose; and also a regional hub for the Sacramento and San Joaquin Valleys. Today's Japantown is located in the Western Addition, centered at Post and Buchanan Streets, where it has been for more than a century. It's one of several neighborhoods where Japanese Americans have settled in the past 125 years. When Japanese Americans started arriving in San Francisco (1880s to early 1900s) initially they settled in two other neighborhoods–in Chinatown (particularly along Grant south of California Street), and South of Market, a rough-and-tumble working class district on the back streets between Market, Mission, 5th, and 7th Streets. A few busineses and institutions were scattered outside these neighborhoods – for instance, import/export businesses were located close to the waterfront; art good stores on the edge of downtown and Pacific Heights did business with white clientelle; the Buddhist Church's first permanent home was on lower Polk Street, and the Presbyterian mission was on lower Haight Street. 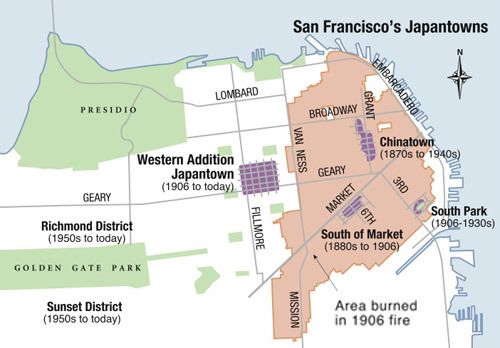 Along with most of San Francisco, South of Market and Chinatown burned to the ground in the 1906 earthquake and fire (see map). Some folks took refuge in Lafayette Park, or at the Hagiwara family's Japanese Village nursery at 4th Ave. and Lincoln Way outside Golden Gate Park; others relocated to the East Bay and beyond. The city's Japanese American leaders looked about for a permanent place to resettle; church leaders also sought a more respectable neighborhood. They decided that the Western Addition would be a good location, and once the downtown was rebuilt, rents would return to reasonable rates and space would open up.They were right. Just west of the fire zone, the Western Addition or Fillmore neighborhood had been built in the 1870s, and consisted mainly of Italianate (1870s) and Stick-style (1880s) Victorian rowhouses. There were also corner stores, livery stables, lumber and coal dealers, churches and synagogues, and an abandoned cable car barn; a little farther south, along Fillmore, were theaters, bakeries, and industrial uses such as laundries and breweries. Several streetcar and cable car lines criss-crrossed the neighborhood. Following the earthquake, narrow Fillmore Street became the city's main civic and commercial street (at least for white-owned busineses). Old mansions served as department stores, and churches and synagogues doubled as courthouses. Nearby homeowners cut up their old Victorians into apartments and hotels; many owners added storefronts in their former front yards, tucked between their steps and their neighbors'. Eventually, as businesses returned downtown, and residents of means moved to newer, less-crowded neighborhoods, Japanese Americans found this densely built, mixed-use, mixed-race neighborhood an ideal place to establish a growing community. 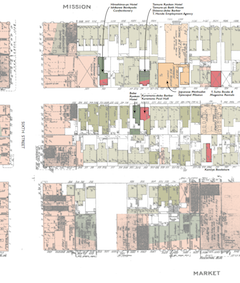 Around 1910, many Japanese American businesses were on Geary Street near Buchanan. By 1940, they had multiplied, and shifted slightly north to Post and Buchanan, where nearly every business for several blocks was Japanese American. A fair number of busineses rebuilt in Chinatown, lasting right up to 1942. They were located mainly along Grant, between California and Sutter Streets. Several of the old, post-earthquake, pre-WWII storefronts appear to remain but we have not surveyed them in detail. Maps in progress. 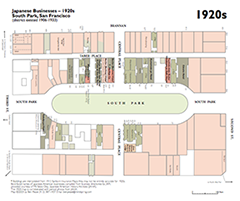 Perhaps the most physically intact Japantown in San Francisco is South Park, which was home to a small but thriving assortment of Japanese hotels from 1906 to 1933. The old Southern Pacific depot was just two blocks south, and Piers 30-32, where the Japanese steamships docked, was two blocks east. But in the 1930s the steamships shifted to north of the Ferry Building, and severe immigration restrictions cut travel to and from Japan. Pretty much all the remaining South Park businesses closed or relocated to the Western Addition. Several of the old South Park hotels still stand today, and two are owned by low-cost housing cooperatives, so continue in some semblance of their old uses. During WWII, 5000 persons of Japanese ancestry were interened from San Francisco. In April 1942, residents gathered with what belongings they could carry, and boarded busses in front of Kinmon Gakuen on Bush Street, to Tanforan Assembly Center (a converted racetrack) in San Bruno. After six months, most San Franciscan Nikkei were incarceratd at the Topaz, Utah "Internment Camp" from 1943 to 1945. On their return to the city, Japanese Americans gradually rebuilt their lives. Several churches operated hostels in their gyms and basements for struggling elders and returning families until 1951. Eventually, as racial restrictions on housing were struck down, some families resettled throughout the city, particularly the Richmond and Sunset Districts, though Japantown remained the commercial and cultural core. Meanwhile, during the war, 60,000 African Americans had come to San Francisco from the South to work in shipyards and industries. Half of them squeezed into the Western Addition, many using formerly Japanese American homes, apartments, storefronts, and churches. No sooner had Japanese Americans gotten back on their feet, and the African Americans settled in, than the city proposed to tear down their "blighted" neighborhood and build it back up with apartment towers and shopping malls. Federal money was available for such projects, and San Francisco's leaders went out looking for problems to solve. As a guest on my walking tours said, "Most problems are caused by solutions." With the Depression, the War, rumors of urban renewal, and more than a decade of delay, "blight" became a self-fulfilling prophecy, as homeowners were reluctant to invest in repairs. (I've talked to people who said it was rather funky and run-down, but other people say many of the houses were in good shape and well-tended. There is probably truth in both assertions). In any case, the San Francisco Redevelopment Agency (RDA) tore down 20 blocks along Geary Street in 1951 to build Geary Expressway. Adjacent land was cleared and sold off in large parcels to developers, to create housing towers and shopping centers. Several blocks were rebuilt very quickly, however the three blocks bounded by Post, Laguna, Geary, and Fillmore remained vacant for half a decade while RDA figured out how to finance construction of the Japanese Cultural and Trade Center (today's Japan Center). Finally construction began around 1965 and Japan Center opened to great (if somewhat manufactured) fanfare in 1968. Developed with Japanese and Hawaiian Issei financing, it included three blocks of exhibition space for manufacturing and tourism, plus restaurants and a dinner theater with dance revues (today's Kabuki Movie Theater). Osaka, San Francisco's sister city in Japan, donated the 160-foot tall Peace Pagoda. Even before the concrete was poured on Japan Center, RDA proposed to tear down another 30 blocks of the Western Addition, including a two-by-four block swath of Japantown. This time they realized they had to involve stakeholders; but merchants and property owners were offered a chance to hire their own architect/planner, Rai Okamoto, and create a vision of what to rebuild (but were not given the option of not rebuilding). This A-2 phase resulted in the Buchanan Mall streetscape with Ruth Asawa's river of cobblestones and Origami Fountains, lined by small-scale, modern shops, and reconstruction of several of the churches. Redevelopment legacy continues to affect Japantown today, particularly the splitting of the area between Redevelopment and Planning Department jurisdiction, and the consolidation of small properties into large swaths of corporate ownership. The recent sale of Japan Center has refocused community efforts to regain some aspect of say in what gets built, what gets kept, and as part of that process, fighting to preserve what's worth preserving. The 1906 earthquake and fire put a bit of a pall on San Francisco, which shifted business attention and growth to other areas – locally to the East Bay; regionally to Los Angeles. 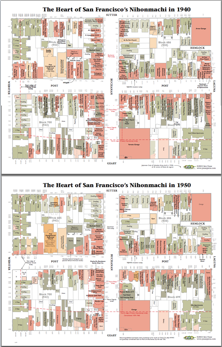 By 1940, San Francisco had perhaps half the Nikkei population of LA's Little Tokyo. San Francisco's Japantown is still relatively residential (with lightly-built storefronts) and most of the big institutions (except for import/export busineses) were right in the neighborhood. Whereas LA's Little Tokyo grew as dense strip of hotels in an originally rural/residential area of river bottom; eventually areas behind the strip became increasingly industrial, and community uses shifted to other areas (particularly Boyle Heights) so what remains (and survived the growth of downtown and decline of industrial uses) feels much more urban.